IRCTC’s first attempt at partnering with eCommerce site and selling products on their platform did not go very well, as they nulled their partnership with Yebhi in less than a year’s time. Now, IRCTC has gone ahead and floated another tender inviting bids for selection of vendors who can partner with them to create a co-branded online marketplace. We look at some of the highlights of the tender. open commerce platform with all the standard functionality including navigation, shopping cart, checkout, shipping and handling, and taxes and order management. Bidders needs to have location based products and deals, vouchers, coupons and promotion discounts which helps IRCTC consumers. Expedited logistics and pickup spots need to be present. The bidder needs to provide personalized shopping experience where the site knows what person is interested in, and offers personalized deals and vouchers. Apart from these, IRCTC has come up with nearly 28 different parameters based on which technical qualification will be made for the bidder. Some of them include having over 100,000 SKUs at the time of the launch, over 500 sellers needed on the platform, have dedicated support team etc. Interestingly, what we can say is only a handful of eCommerce sites will be eligible given the kind of parameters IRCTC has put forth. None of the medium or smaller players really qualify for the same. In our view only Flipkart, Snapdeal, Amazon and couple of others may qualify! 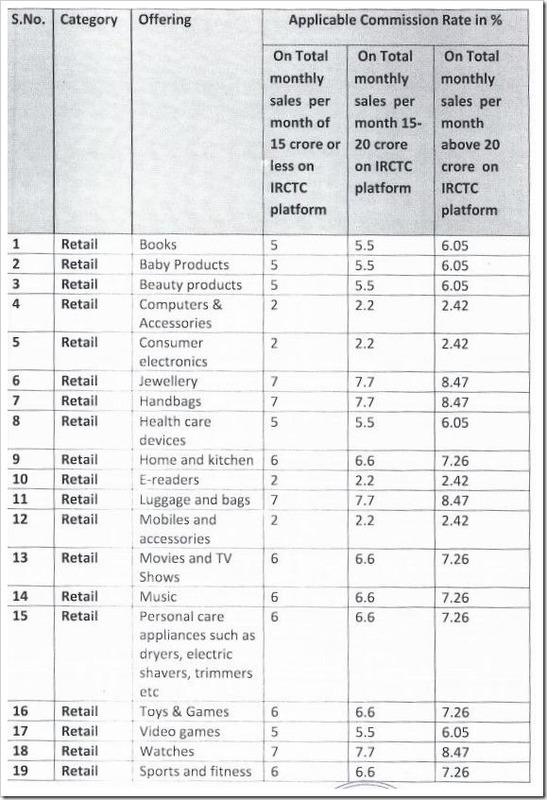 IRCTC tender also lists down the commission structure that will be offered to the bidders for the products that will get sold on IRCTC. Here is the extract from the tender document that shows the commission structure. The commission structure is tiered and attracts more commission for higher sales. The reserve price for Annual Guarantee to IRCTC is Rs. 7,82,00,000 (7.82 cr) for each year of the contract and taxes thereof will be borne by the bidder. The same amount of annual guarantee will be paid by successful bidder for each year of contract. 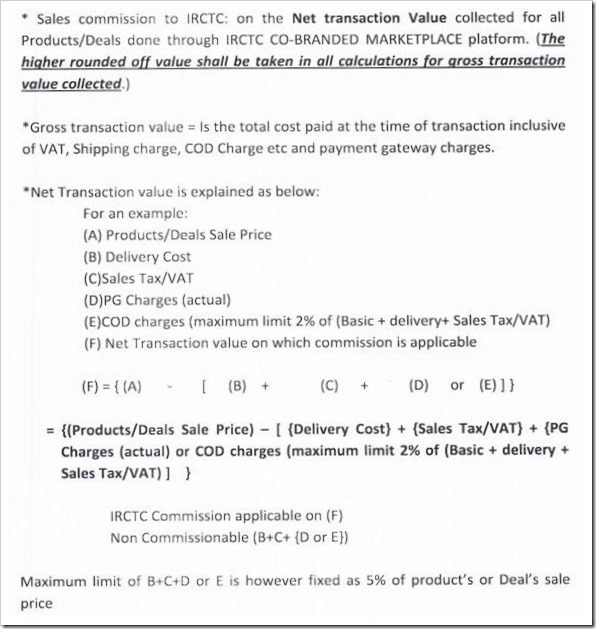 We went through entire 71 page document and one thing is clear – IRCTC wants bid from only the top eCommerce players. Like we said earlier, most of the eCommerce sites will not qualify for this tender. In our view there is high chance that no one may bid for this tender, given the stringent regulations laid down. The top players already have their hands full competing with each other. While IRCTC may give them extra customers, it will also mean lot more effort! We will need to wait and watch what happens and should know who is the unlucky vendor this time around! You can see the entire IRCTC tender document embedded below.